Einstein’s statement was not merely an attempt at consolation. Many physicists argue that Einstein’s position is implied by the two pillars of modern physics: Einstein’s masterpiece, the general theory of relativity, and the Standard Model of particle physics. The laws that underlie these theories are time-symmetric—that is, the physics they describe is the same, regardless of whether the variable called “time” increases or decreases. Moreover, they say nothing at all about the point we call “now”—a special moment (or so it appears) for us, but seemingly undefined when we talk about the universe at large. 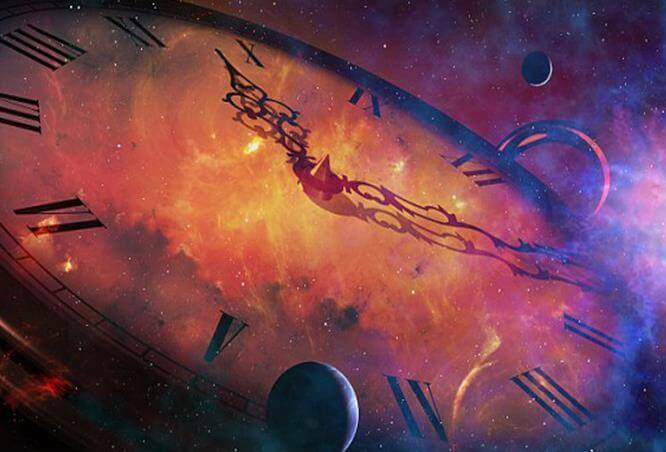 The resulting timeless cosmos is sometimes called a “block universe”—a static block of space-time in which any flow of time, or passage through it, must presumably be a mental construct or other illusion. Many physicists have made peace with the idea of a block universe, arguing that the task of the physicist is to describe how the universe appears from the point of view of individual observers. To understand the distinction between past, present and future, you have to “plunge into this block universe and ask: ‘How is an observer perceiving time?’” said Andreas Albrecht, a physicist at the University of California, Davis, and one of the founders of the theory of cosmic inflation.Others vehemently disagree, arguing that the task of physics is to explain not just how time appears to pass, but why. For them, the universe is not static. The passage of time is physical. “I’m sick and tired of this block universe,” said Avshalom Elitzur, a physicist and philosopher formerly of Bar-Ilan University. “I don’t think that next Thursday has the same footing as this Thursday. The future does not exist. It does not! Ontologically, it’s not there.”Last month, about 60 physicists, along with a handful of philosophers and researchers from other branches of science, gathered at the Perimeter Institute for Theoretical Physics in Waterloo, Canada, to debate this question at the Time in Cosmology conference. The conference was co-organized by the physicist Lee Smolin, an outspoken critic of the block-universe idea (among other topics). His position is spelled out for a lay audience in Time Reborn and in a more technical work, The Singular Universe and the Reality of Time, co-authored with the philosopher Roberto Mangabeira Unger, who was also a co-organizer of the conference. In the latter work, mirroring Elitzur’s sentiments about the future’s lack of concreteness, Smolin wrote: “The future is not now real and there can be no definite facts of the matter about the future.” What is real is “the process by which future events are generated out of present events,” he said at the conference. Those in attendance wrestled with several questions: the distinction between past, present, and future; why time appears to move in only one direction; and whether time is fundamental or emergent. Most of those issues, not surprisingly, remained unresolved. But for four days, participants listened attentively to the latest proposals for tackling these questions—and, especially, to the ways in which we might reconcile our perception of time’s passage with a static, seemingly timeless universe. There are a few things that everyone agrees on. The directionality that we observe in the macroscopic world is very real: Teacups shatter but do not spontaneously reassemble; eggs can be scrambled but not unscrambled. Entropy—a measure of the disorder in a system—always increases, a fact encoded in the second law of thermodynamics. As the Austrian physicist Ludwig Boltzmann understood in the 19th century, the second law explains why events are more likely to evolve in one direction rather than another. It accounts for the arrow of time. But things get trickier when we step back and ask why we happen to live in a universe where such a law holds. “What Boltzmann truly explained is why the entropy of the universe will be larger tomorrow than it is today,” said Sean Carroll, a physicist at the California Institute of Technology, as we sat in a hotel bar after the second day of presentations. “But if that was all you knew, you’d also say that the entropy of the universe was probably larger yesterday than today— because all the underlying dynamics are completely symmetric with respect to time.” That is, if entropy is ultimately based on the underlying laws of the universe, and those laws are the same going forward and backward, then entropy is just as likely to increase going backward in time. But no one believes that entropy actually works that way. Scrambled eggs always come after whole eggs, never the other way around. To make sense of this, physicists have proposed that the universe began in a very special, low-entropy state. In this view, which the Columbia University philosopher of physics David Albert named the “past hypothesis,” entropy increases because the Big Bang happened to produce an exceptionally low-entropy universe. There was nowhere to go but up. The past hypothesis implies that every time we cook an egg, we’re taking advantage of events that happened nearly 14 billion years ago. “What you need the Big Bang to explain is: ‘Why were there ever unbroken eggs?’” Carroll said. Some physicists are more troubled than others by the past hypothesis. Taking things we don’t understand about the physics of today’s universe and saying the answer can be found in the Big Bang could be seen, perhaps, as passing the buck —or as sweeping our problems under the carpet. Every time we invoke initial conditions, “the pile of things under the rug gets bigger,” said Marina Cortes, a cosmologist at the Royal Observatory in Edinburgh and a co-organizer of the conference. Other physicists, however, point out that it’s normal to develop theories that can describe a system given certain initial conditions. A theory needn’t strive to explain those conditions. Can the arrow of time be understood without invoking the past hypothesis? Some physicists argue that gravity—not thermodynamics—aims time’s arrow. In this view, gravity causes matter to clump together, defining an arrow of time that aligns itself with growth of complexity, said Tim Koslowski, a physicist at the National Autonomous University of Mexico (he described the idea in a 2014 paper co-authored by the British physicist Julian Barbour and Flavio Mercati, a physicist at Perimeter). Koslowski and his colleagues developed simple models of universes made up of 1,000 point-like particles, subject only to Newton’s law of gravitation, and found that there will always be a moment of maximum density and minimum complexity. As one moves away from that point, in either direction, complexity increases. Naturally, we—complex creatures capable of making observations—can only evolve at some distance from the minimum. Still, wherever we happen to find ourselves in the history of the universe, we can point to an era of less complexity and call it the past, Koslowski said. The models are globally time-symmetric, but every observer will experience a local arrow of time. It’s significant that the low-entropy starting point isn’t an add-on to the model. Rather, it emerges naturally from it. “Gravity essentially eliminates the need for a past hypothesis,” Koslowski said. The idea that time moves in more than one direction, and that we just happen to inhabit a section of the cosmos with a single, locally defined arrow of time, isn’t new. Back in 2004, Carroll, along with his graduate student Jennifer Chen, put forward a similar proposal based on eternal inflation, a relatively well known model of the beginning of the universe. Carroll sees the work of Koslowski and his colleagues as a useful step, especially since they worked out the mathematical details of their model (he and Chen did not). Still, he has some concerns. For example, he said it’s not clear that gravity plays as important a role as their paper claims. “If you just had particles in empty space, you’d get exactly the same qualitative behavior,” he said. Unlike the traditional block view, Ellis’s picture appears to describe a universe with an open future. Increasing complexity, Koslowski said, has one crucial side effect: It leads to the formation of certain arrangements of matter that maintain their structure over time. These structures can store information; Koslowski calls them “records.” Gravity is the first and primary force that makes record formation possible; other processes then give rise to everything from fossils and tree rings to written documents. What all of these entities have in common is that they contain information about some earlier state of the universe. I asked Koslowski if memories stored in brains are another kind of record. Yes, he said. “Ideally we would be able to build ever more complex models, and come eventually to the memory in my phone, the memory in my brain, in history books.” A more complex universe contains more records than a less complex universe, and this, Koslowski said, is why we remember the past but not the future. But perhaps time is even more fundamental than this. For George Ellis, a cosmologist at the University of Cape Town in South Africa, time is a more basic entity, one that can be understood by picturing the block universe as itself evolving. In his “evolving block universe”model, the universe is a growing volume of space-time. The surface of this volume can be thought of as the present moment. The surface represents the instant where “the indefiniteness of the future changes to the definiteness of the past,” as he described it. “Space-time itself is growing as time passes.” One can discern the direction of time by looking at which part of the universe is fixed (the past) and which is changing (the future). Although some colleagues disagree, Ellis stresses that the model is a modification, not a radical overhaul, of the standard view. “This is a block universe with dynamics covered by the general-relativity field equations—absolutely standard—but with a future boundary that is the ever-changing present,” he said. In this view, while the past is fixed and unchangeable, the future is open. The model “obviously represents the passing of time in a more satisfactory way than the usual block universe,” he said. Unlike the traditional block view, Ellis’s picture appears to describe a universe with an open future—seemingly in conflict with a law-governed universe in which past physical states dictate future states. (Although quantum uncertainty, as Ellis pointed out, may be enough to sink such a deterministic view.) At the conference, someone asked Ellis if, given enough information about the physics of a sphere of a certain radius centered on the British Midlands in early June, one could have predicted the result of the Brexit vote. “Not using physics,” Ellis replied. For that, he said, we’d need a better understanding of how minds work. The challenge, she said, is to frame this first-person experience within the static block offered by physics. In the face of these competing models, many thinkers seem to have stopped worrying and learned to love (or at least tolerate) the block universe. Perhaps the strongest statement made at the conference in favor of the block universe’s compatibility with everyday experience came from the philosopher Jenann Ismael of the University of Arizona. The way Ismael sees it, the block universe, properly understood, holds within it the explanation for our experience of time’s apparent passage. A careful look at conventional physics, supplemented by what we’ve learned in recent decades from cognitive science and psychology, can recover “the flow, the whoosh, of experience,” she said. In this view, time is not an illusion—in fact, we experience it directly. She cited studies that show that each moment we experience represents a finite interval of time. In other words, we don’t infer the flow of time; it’s part of the experience itself. The challenge, she said, is to frame this first-person experience within the static block offered by physics—to examine “how the world looks from the evolving frame of reference of an embedded perceiver” whose history is represented by a curve within the space-time of the block universe. Ismael’s presentation drew a mixed response. Carroll said he agreed with everything she had said; Elitzur said he “wanted to scream” during her talk. (He later clarified: “If I bang my head against the wall, it’s because I hate the future.”) An objection voiced many times during the conference was that the block universe seems to imply, in some important way, that the future already exists, yet statements about, say, next Thursday’s weather are neither true nor false. For some, this seems like an insurmountable problem with the block-universe view. Ismael had heard these objections many times before. Future events exist, she said, they just don’t exist now. “The block universe is not a changing picture,” she said.“It’s a picture of change.” Things happen when they happen. “This is a moment—and I know everybody here is going to hate this—but physics could do with some philosophy,” she said. “There’s a long history of discussion about the truth-values of future contingent statements—and it really has nothing to do with the experience of time.” And for those who wanted to read more? “I recommend Aristotle,” she said.